Technical Pro’s speaker design is one of the most professional designs on the market today. They have quickly risen to the top of the competition for their selection of professional studio monitors and loudspeakers. The same design used can be found in the SPH4 Bookshelf Speakers. If you are need of a pair of bookshelf speakers for your personal audio set up, showroom or office sound system the SPH4 Bookshelf Speakers are a great choice and a price that is very affordable! The SPH4 boasts a very stylish and professional design. Aligned with the theory that these speakers are made with the built-to-last attitude, they are also classy enough to impress any listener at one glance. The compact gray design will add a touch of class to your bookshelf or entertainment set up. The front panel has a removable panel of soft fabric used to protect the speaker from any dust or particles. Remove the panel and you have a stylish piano finish face. The protective casing holds high quality components that will not fail! Located inside the SPH4 speakers is one 4” woofer and one 3” tweeter. This speaker can push out a total peak power of 100 watts. This is the perfect amount of power output for playback for any standard bookshelf speaker playback! 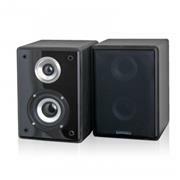 These speakers can be placed on shelf or table or mount them to the wall using the wall mount brackets! With so many choices of bookshelf speakers on the market it’s a no brainer to go with a professional company like Technical Pro, known for making high quality professional audio products that are built to last the test of time. The SPH4 is one of the best bookshelf speakers on the market today and at a price that is almost too low to list!